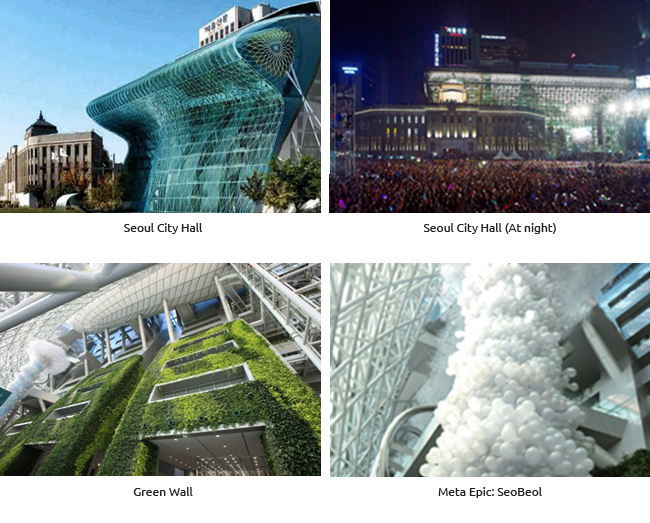 The Green Wall is the most popular attraction at the Seoul City Hall building. Spanning an area of 1516m2, the size of a soccer field, this vertical garden climbs up the inner wall, all the way from the first to the seventh floor. It was named in the Guinness World Records as the largest vertical garden in the world. Over 70,000 plants of 14 different species were planted in the garden over an eight-month period. They help to eliminate contaminants and fine dust and regulate the temperature and humidity. When visitors take the elevator or escalator from the Haneul Plaza on the ninth floor down to the first floor, where the double skin façade can be clearly seen, it feels like being inside a space ship.